This french onion tart is seriously delicious. I call it a tart because it’s not as “eggy” as a quiche and the base is thicker. I’ve tried to keep it as close to a traditional french tart as possible and I hope I have done it justice. Traditionally, gruyère cheese would be used which I couldn’t find so I used a really good vintage cheddar instead. This is a typical dish that I would batch cook at the weekends and freeze for work lunches. It freezes really well and defrosts overnight in the fridge. As a busy working mum who cooks a lot thanks to the Specific Carbohydrate Diet (SCD), having the freezer stocked saves my life! 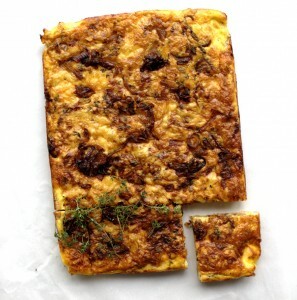 The flavour in this tart mainly comes from the caramelized onions. This recipe does require some cooking time but it is worth every second. After more than twenty minutes of sautéeing, the onions become sweet and sticky. This paired with the saltiness of the pastry and cheese is SO good. I’m a sucker for the sweet and savoury combination any day. 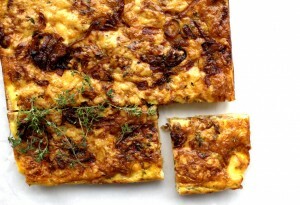 I used fresh thyme from our garden for this french onion tart and it works really well. Having a herb garden outside is so handy and I use fresh herbs every day in my cooking. Don’t be put off starting a herb garden thinking that it requires a lot of effort. It really requires very little maintenance. I’d really love to grow our own vegetables too someday but at the moment we just don’t have the time. Before beginning SCD, I could only have dreamed of eating this. Minutes after eating onions, my stomach would cramp. It was a pain similar to labour contractions. I’m not even exaggerating! After removing: gluten, grains, refined sugar and lactose I was amazed at the foods I was able to tolerate. Onions, garlic, coffee, cauliflower, spinach, I could go on. So when people say to me that I’m missing out on so much in my diet, I laugh. If they only knew! A delicious healthy take on this classic french dish which is free from: gluten and grains and suitable for the Specific Carbohydrate Diet (SCD). 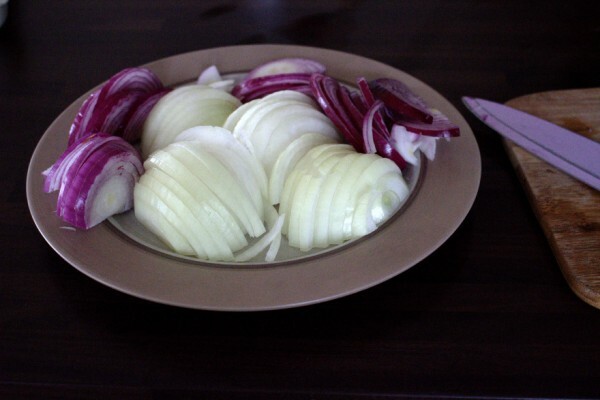 Chop the onions, first in halves then into slices as shown. Place a saucepan or iron skillet on a medium heat and add the butter and olive oil. Once the butter has melted, add the onions. Sauté for ten minutes on a medium heat until the onions soften then reduce to a low heat and continue to cook for a further 20 minutes. Stir frequently so they don't stick to the bottom of the pan. Season lightly with sea salt and black pepper. Meanwhile, preheat the oven to : 160°C Fan, 180°C electric, 350°F or gas mark 4 and make the pastry. In a blender, combine all the crust ingredients. Grease a large rectangular baking dish well with olive oil, then line it with parchment paper and press it down. Press the crust into the baking dish with a fork and spoon until even and smooth. Bake for 20 minutes. Meanwhile, prepare the tart filling by mixing the eggs and yoghurt well in a bowl. Season lightly with sea salt and black pepper. Remove the pastry from the oven once cooked and sprinkle roughly one quarter of the cheese on the crust. Next, add most of the onions in a layer over the cheese keeping about four tablespoons aside for the top of the tart. Next, pour the egg and yoghurt mixture on top followed by the rest of the cheese. Finish the tart by spreading out the onions you kept aside. Sprinkle the thyme on top of the onions. Bake for 45 minutes.